When we took on the plot I had high ideas about embracing nature. It took precisely one decimated crop for me to do a complete volte face and declare war. We used a combination of pellets from the pound shop and hand picking. It was very effective and simple but I was not wholly comfortable with the pellets worrying about their impact on wildlife. The RSPB unsurprisingly are not great fans. Anne Wareham from Veddw House Garden brought an article called How To Combat Slugs and Snails from The Telegraph to my attention last week via Twitter and it started me thinking what I would do this year. Alan Titchmarsh in his book The Kitchen Gardener suggests a combination of methods, copper tapes, beer traps etc. and what he refers to as ‘alternative’ remedies, dehydrating granules, garlic or yucca extract, grit and even holly leaves. He also suggests biological control in the from of nemtodes which work by infecting the slugs with disease. Nice! The BBC has a very good guide on their website here. This was the offer at the local garden centre yesterday. Barrier methods and traps certainly seem to have a higher presence than I’ve seen previously but I’m not sure they are entirely practical for an allotment. Ultimately I think it depends on the size of the plot and what type of crops you are growing. I am however going to try some of these different methods and will report back later in the season. Let me know in the comments what method you choose. I’ve tried the copper tape around my pots in the greenhouse this year as I was somehow plagued by slugs in there (even after completely emptying the greenhouse and checking every single pot, tub, etc for the critters). I have to say the tape did work as a barrier but I found that you had to stick the tape to completely clean pots or the tape would come unstuck which then left gaps for slugs to crawl around. I also found that after watering a few times the tape would then become watermarked which again reduced its’ effectiveness against shocking the slugs. Needless to say I would use it again as I did think it successful. 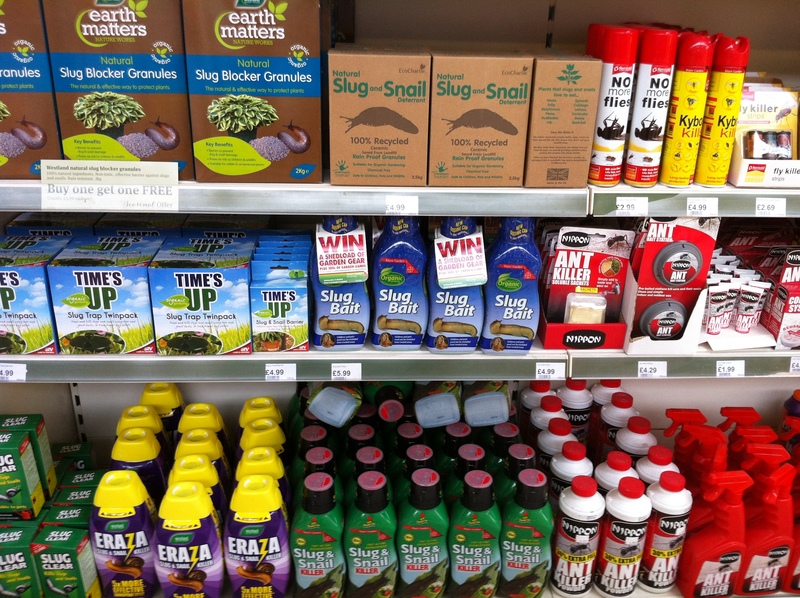 I am interested in the “wool” slug pellets too – I also spin my own yarn so regularly buy wool fleece and am wondering if I placed a thin layer of fleece around my plants would it work in the same way to detract the slugs? I feel an experiment coming on next Spring!! Thank you very much for taking the time to comment. It has been the subject of much debate on all the gardening forums here this summer. The information on copper tape is very useful so I will certainly pass that on next time the subject arises. I found barrier methods ineffective on the whole but if wool is a natural repellant then it is definitely worth a go. Also there is a forum strand on UK Veg Gardeners (the tab is on the side bar) about wool as a mulch that you might find of interest. Laughing, I’ve just found you on UK Veg Gardeners, so scrub my previous comments you already know all about the fleece conversation.